Alton Drag Strip - $10.00 : Bob Hoyts Classic Inspection Stickers, Add a Final Touch to your Restoration! 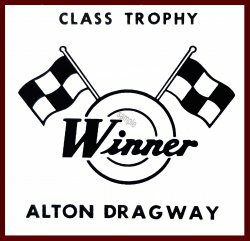 Thousands of people went to Alton Dragway between 1958 and 1972 for various reasons. Some were spectators, and some had the ultimate pleasure of racing there. Racing legends like Karamesines, “Big Daddy” Don Garlits, Don “The Snake” Prudhomme, Bill “Maverick” Golden and the racing group of Stone, Woods and Cook all frequented Alton Dragway. A cool reminder of the times that were. This sticker has our "Peel and Stick format which allows attaching to the inside window of your car.